There have been plenty of sleep deprived mornings where I’ve got to get everyone out the door to school and work and wearily reach for my box of Kodiak Cakes whole wheat pancake mix. Don’t get me wrong, I love Kodiak Cakes. 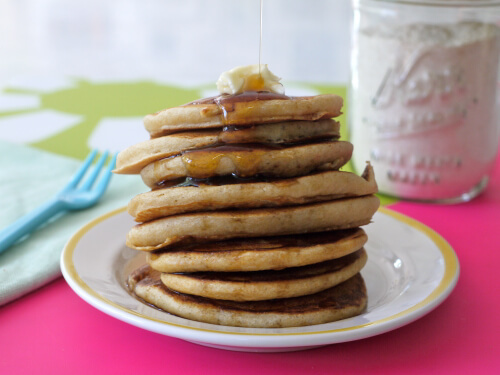 They are easy to make, made from wholesome ingredients and turn out awesome pancakes every time. But at almost $6 on box, I resolved to come up with my own simple, make-ahead mix that I could keep in the pantry. It took me a bit of trail and error, but I’m finally over the moon — I mean really over the moon — with this recipe. It actually may be one of my favorite weelicious recipes because of how versatile it is: I used the mix to make waffles this morning and the kids actually said they were the best I’d ever made! This recipe makes a bit more mix than what you would normally find in a box of the pre-made stuff, but that’s a plus, especially if you have a house full of pancake lovers. Just keep the mix in a sealed container and anytime you want to make these, just add an egg, milk, a touch of oil and a scoop of mix for whole wheat pancakes or waffles that are sure to please!